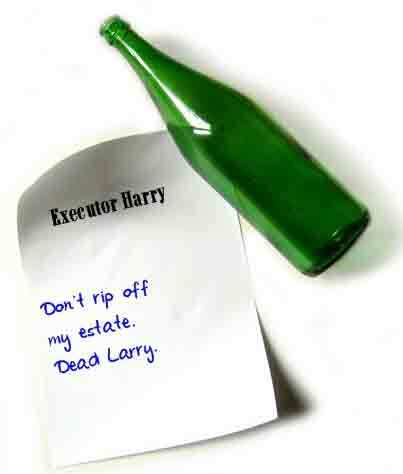 An executor is the person named in a will to administer a decedent's estate. If an executor cannot do the job, or if there is no will, the court appoints someone to manage the estate: that person is called an administrator. Executors and administrators are referred to as personal representatives. All personal representatives are trustees which is why the issue of their compensation is usually parked within a statute called trustee act. In common law, the executor or administrator of an estate had no right to fees, as this placed him in a financial conflict of interest with the estate. "[T]he Court had no power to allow compensation to an executor unless there was an express contract or other stipulation for remuneration, and that was still the law of England today. Unless, therefore, an executor or trustee could bring himself within the scope of (the estate administration statute), or could show some agreement, he could not recover compensation." If the will sets out a lump sum or formula for compensation, that is the applicable fee; law unique but binding between all the parties to the estate. You need, then, not read the rest of this article unless you are a fan of deep, intriguing, life-changing prose. "88(3) A person entitled to an allowance (as set out above) ... may apply annually to the Supreme Court for a care and management fee and the court may allow a fee not exceeding 0.4% of the average market value of the assets. "90. Nothing in section 88 ... applies in any case in which the allowance is set by the instrument creating the trust." Five per cent (5%) is the maximum - the cap - in British Columbia, that a personal representative can charge as a fee. violate the true principle upon which compensation is always to be estimated. the usual percentages would result in a grossly excessive allowance." "From the American and Canadian precedents, based upon statutory provision for compensation to trustees, the following circumstances appear proper to be taken into consideration in fixing the amount of compensation: (1) the magnitude of the trust; (2) the care and responsibility springing therefrom; (3) the time occupied in performing its duties; (4) the skill and ability displayed; (5) the success which has attended its administration." Thus, the percentage set out in the relevant statute is the maximum 2, 3 or 5 %, and whether to apply that maximum, is a matter of assessing the job to-do and actually done in accordance with the principles set out in Toronto General Trusts. Saskatchewan Trustee Act, §52 ("... reasonable allowance for administration of an estate..."). ".. it is not the usual practice of this court to award a full 5% fee...."
"Each estate must be considered individually, as the work involved in administration varies to a great extent and depends upon the matters to be considered. It is quite possible for a relatively small estate to make necessary work proportionately greater than in some of the larger estates. "There has been a general tendency to fix the amount of compensation by allowing a percentage upon the total value of the estate, which system has been used and recognized and applied in many reported decisions. It is, however, not a rule but a basis upon which a judge can take consideration when fixing compensation. The usual percentage allowed would appear to be two per cent on the amount of the estate being administered, with variations for certain services rendered – such as five per cent for the collection of income and one per cent for collection and distribution of capital..."
"The executor has provided absolutely no accounting for time spent in the course of administration of the estate. He seeks compensation at the high end of a level that a professional administrator might seek to receive, without having demonstrated any of the skill and ability expected of a professional administrator. He seeks a management fee for a period of ten and one-half years, which includes approximately three and one-half years after the estate should have been distributed. He expended considerable fees for accounting services for an estate of little or moderate complexity." "A rule of thumb for professional executors appears to be about 3 to 5% of the value of the estate...."
"[T]here is a presumption that when a legacy or annuity is left to an executor, it is intended to be in lieu of the compensation to which he would otherwise be entitled. But this presumption, like the presumption that such a provision is conditional upon the executor's proving the will, applies only when the bequest is made to the executor in his capacity as executor and yields to very slight indications of a contrary intention. Thus the presumption does not arise when what is given to the executor is not a legacy or annuity but a share of the residue of the estate; or if the legacy to the executor is to be paid only on the expiration of a life interest. And when a legacy is left to an executor with a provision that if he predeceases the testator the legacy is to go to his executors this is sufficient to rebut the presumption." An executor is not entitled to pay himself or herself in advance. In estate law, this is often referred to pre-taking. "... two pre-conditions for payment of remuneration to an executor. Those pre-conditions were either passing of the executors’ accounts or, if the accounts had not been passed, obtaining the beneficiaries’ consent to the payment." This judicial nonsense opens Pandora's box and suggests that executors can adopt a take now, seek approval later policy which is, bluntly put, a recipe for breach of trust. Whether it is in statute or not, Canadian jurisdictions tend to defer to a 5% cap as a benchmark for executor fees. Unfortunately, many personal representatives put forward a 5% fee where they are not otherwise entitled to it. Conversely, many personal representatives seek less than their entitlement. At the end of the day, this is an area where legal advice may necessary, given the variables as set out by the courts and that executors often seek to eke out more than they are entitled to. Also, be wary of executor who list as a disbursement the fees of a professional, such as a lawyer or an accountant, and yet seek the maximum fees for themselves: can you spell double-dipping? If a professional was retained to assists, that results in less work for the executor and the fee should reflect that. Dunbar v. Dunbar Estate, 2007 BCSC 1642; at¶ 6. Note 1: CCH Canadian Limited, Canadian Estate Administration Guide, 2009, ¶29,683, "In Ontario, the accepted rate of compensation is often quoted as 5% of the value of the estate."